We are proud to introduce the SOMA hair care line, as it is Organic based, Vegan, Sulfate-Free and Hypo-Allergenic. All of SOMA's products are formulated with a paraben-free and formaldehyde-free preservative; being one of the only globally approved preservatives, SOMA consumers can be reassured that all of their products are safe and offer no toxicological hazards. SOMA Complete Colour is a deposit-only permanent color line, infused with Keratin protein and sunflower oil for moisture. SOMA Complete Color is ammonia- and MEA-free. SOMA's fully Vegan line has incorporated the most sophisticated plant ingredients to give superior results over conventional professional product lines. All of our ingredients go through stringent testing to ensure quality. Ingredients are quarantined and tested to meet their compliance - stability, purity, and testing for microrganism, are just a few of the quality assurance given to each and every ingredient. No compromise large or small is made giving the end consumer the most scientifically safe product available. 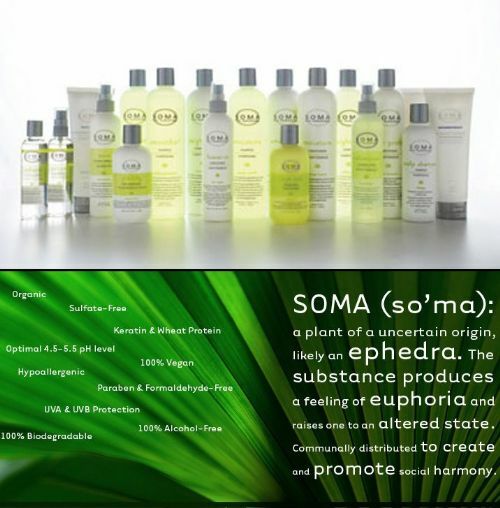 SOMA was established in 1995, since that time they have searched the globe for the most unique and beneficial ingredients to be used in personal care formulations. SOMA has found suppliers throughout the world who not only focus on new and innovative products, but who manage their companies in an earth-friendly manner. Never compromising on performance, SOMA's "Hair Technology" line uses the best ingredients the world has to offer while having a net zero environmental impact.